Be fierce about protecting your boundaries. Q: My partner and I broke up recently, and I’m not sure how to share the news with my friends and family, especially before a string of holiday parties and dinners, where I know people will ask how my relationship is going. I’ve seen a lot of people announce breakups in on their social media, but that feels extremely public to me. Is that just what people do now? Do I owe that public heads up to my family and friends? —I.W. A: Your dilemma is completely understandable and one that many people share with you. The holidays can be stressful, not only because of the traffic, travel, shopping, and general chaos, but also all the social events with family and friends. From Thanksgiving to New Years, you’re probably going to see people who are not a regular part of your life and they’re going to ask about your relationship. Unless you lock yourself in your room, which I wouldn’t recommend, it’s impossible to avoid the conversation. 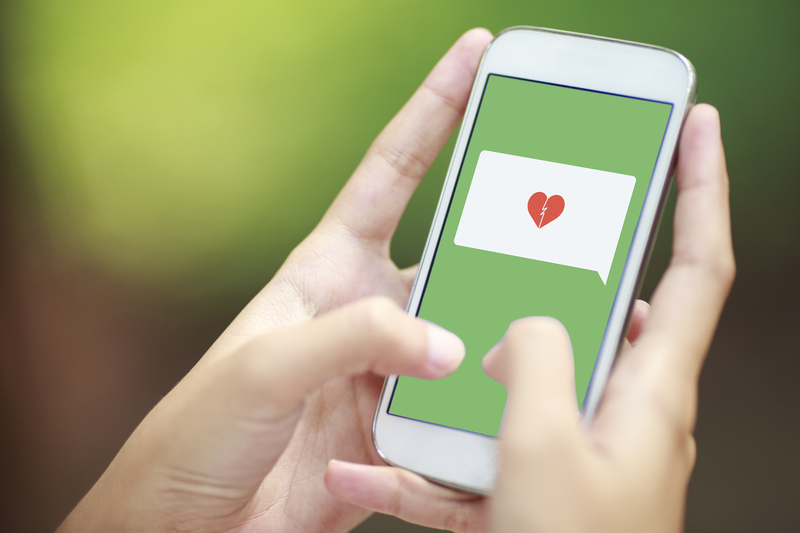 Here’s the bottom line when it comes to announcing your breakup on social media. Your family and friends genuinely care about you and want to know “what’s new,” but you are the one in charge of your life. Life is about both ups and downs, and being an adult means we get to choose how we manage our personal and private information. You’re being wise by pausing to ask the question about the most appropriate way to share the news of your breakup. You get to decide how much you want to share or not share about what has changed in your life, especially the hard, painful, or negative stuff. You don’t owe anyone anything. Here are some thoughts on how you can address this situation with family and friends over the holidays. You’ve already indicated that sharing your news on Facebook feels “extremely public” to you. That’s a signal that a boundary is being triggered for you. So if you would feel uncomfortable making a public disclosure, then don’t! Boundaries are absolutely critical for our sense of comfort and well-being. A boundary is a protective signal within you that your physical, emotional, or social privacy and comfort are being breached. Physical boundaries are easier to understand. Your skin, your room, and your personal space are concrete indicators of what is inside versus outside of you and you get to choose who or what crosses that line. While an emotional or social boundary may not feel as tangible, we experience a sense of discomfort within us when we are about to go outside our comfort zone and we have a right to honor that internal signal. Protecting your boundaries will positively impact your sense of well-being and self-care. So begin by recognizing what feels like a boundary violation to you, either in what you put out in the world or what someone gets to ask you about your private life, and then be fierce about protecting that boundary. Perhaps this isn’t about boundaries for you. Maybe you appreciate the care and concern of your family and friends and want them to know about the breakup, but you’re just apprehensive about the many questions and reactions you will get. In that case, this mindfulness exercise may be helpful. This is an exercise I learned in a personal development retreat where I was paired with someone who was given one question to ask me repeatedly for five minutes. Answering the same question over and over again with a mindful awareness of what is coming up can become a mini-journey of discovery. Treat each repetition of the question with a “beginner’s mind” and try to answer it as if for the first time. Before each answer, check in with yourself and try to articulate your present-moment honest answer to the question. So how would that look in your situation? Before you enter the social situation where you know you will be asked questions about your relationship, begin by preparing yourself. Do a breathing or relaxation exercise to calm your nervous system and create a sense of acceptance and openness within you. Try to empty your mind and avoid imagining the questions or the answers. Walk into the social event with a calm accepting attitude. When the inevitable question arrives, pause, check in with yourself, and give an answer that seems the most authentic in that moment. Try to answer the question only as it is asked, offering an honest but self-aware answer that does not overshare or resist the question. Remember you get to choose how much to reveal about the details of the breakup, but that doesn’t mean you cannot be genuine in your answers. You might answer follow up questions by responding with, “I am still processing the breakup and don’t want to go into more details right now. Let’s talk about this another time,” or “It has been hard but I am doing great today and I want to enjoy myself right now so I am not wanting to get into it.” If the questions are from people you want to share more with, by all means, delve into it. You always have that option. Sharing the story of your breakup and the reasons why you are no longer together may be complex and difficult to describe. And if you had friends in common, you may be apprehensive about being probed, judged, or embarrassed. So put yourself in the driver’s seat and take charge of any conversations about the breakup. Adjust your answer based on the person asking, the place or time of day when this conversation emerges, and your own mood or energy for answering any questions about your ex. The past is the past and it does not have to determine the present unless you want to give it that power. So if you’re in a loud bar and you have to yell to be heard, you might consider conserving your energy by saying less and inviting people to talk to you privately after the holidays. If the person asking isn’t likely to protect your privacy, monitor your comfort level and share only what you are willing to have repeated. If it is the end of the night, feel free to say, “I’ve been telling people about this all night and I’m burned out. Let’s talk next week.” Most importantly, don’t let someone draw you into a conversation where you are being interrogated or evaluated for the decision to part ways with your partner. Nobody needs that kind of suffering at any time of year, certainly not around the holidays. Looking ahead, a new year is full of new possibilities. Own your own peace and embrace the opportunities that are coming your way with your newfound freedom. Vagdevi Meunier, Psy.D., is a Master Trainer for The Gottman Institute and Licensed Clinical Psychologist with over 35 years of experience working with couples, families, and individuals on a relational spiritual journey. She has been a Certified Gottman Therapist and Gottman Workshop Leader since 2006. She is the founder and executive director of the Austin-based Center for Relationships, a community counseling and wellness center that offers relational science-based therapy, education, and training.